In a world of smoking hot vampires that charm the pants (and blood) off young women, there is a new kid in town who doesn’t quite measure up. Meet Doug, a fifteen year-old, overweight, socially awkward dork who gets bitten by a vampire one summer and is accidentally transformed. He thirsts for blood but can’t get any girl to come near him, so he ends up feeding on cows and one cranky panda. A complete package of irony and pathos, Doug makes our hearts bleed, but he can’t have any of it. The only person he has told about his new “condition” is his best friend, Jay. And together they try to navigate the murky depths of vampirism, testing theories as to what legends are true, and which aren’t. Sunlight? Only gives him a sunburn. Turning into a bat? Yes, but he has no idea how that happened. But Doug is desperate for something more, longing for a vampire to show him the ropes. Reading Dracula did not turn out to be much of an instruction manual, after all. When a local vampire summons him and a classmate, Doug thinks he is finally going to get the help he needs. But he is assigned as a protégé to a vampire who is more of a recluse than a teacher. And at school things are rough too—he has major lust for the new girl, an Indian exchange student named Sejal who has problems of her own. As Doug slowly gets the hang of using his new powers to his advantage, things start to improve. For once he has found a group of friends and his social ineptitude dissolves as he discovers his role as class clown. But with his power comes change, which is never easy. Adam Rex (The True Meaning of Smekday, 2007) puts together a complex plot about the agonies of being a teenager amplified by the pains of being a vampire. Rex is very clever at a turn of phrase. “An awkward moment passed between them like a cripple,” is just an example of his unique view of metaphor. In a way they are almost too clever, as several times this reviewer had to backtrack and think about them. While extremely amusing, they ended up disrupting the flow of the story. The cast of characters is rich and well-rounded and makes the reader root for Doug, wanting him desperately to hold on to his humanity despite being a vampire, and his even more dangerous growing popularity among his peers. The only drawback to this laugh-out-loud novel was the irritating “choose your own adventure” ending. Certainly Rex could have chosen one of the possibilities he gives us? 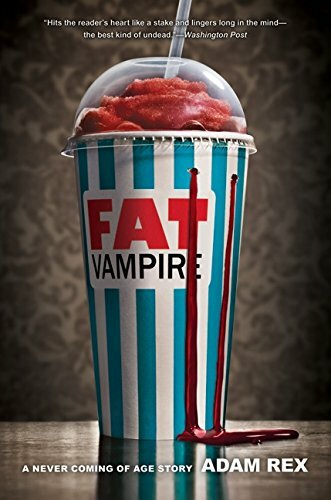 Smart, funny, and extremely clever, Fat Vampire is what John Hughes and Joss Whedon might have created had they worked together. Anna M. Karras is a librarian and experienced reviewer for such publications as Library Journal and School Library Journal.